The following page was written in 2017 while the Sources bibliography was only available in an offline format (using Sente, and then Bookends software). It will be updated in 2019 after advanced search has been implemented on the new website. The T.F. 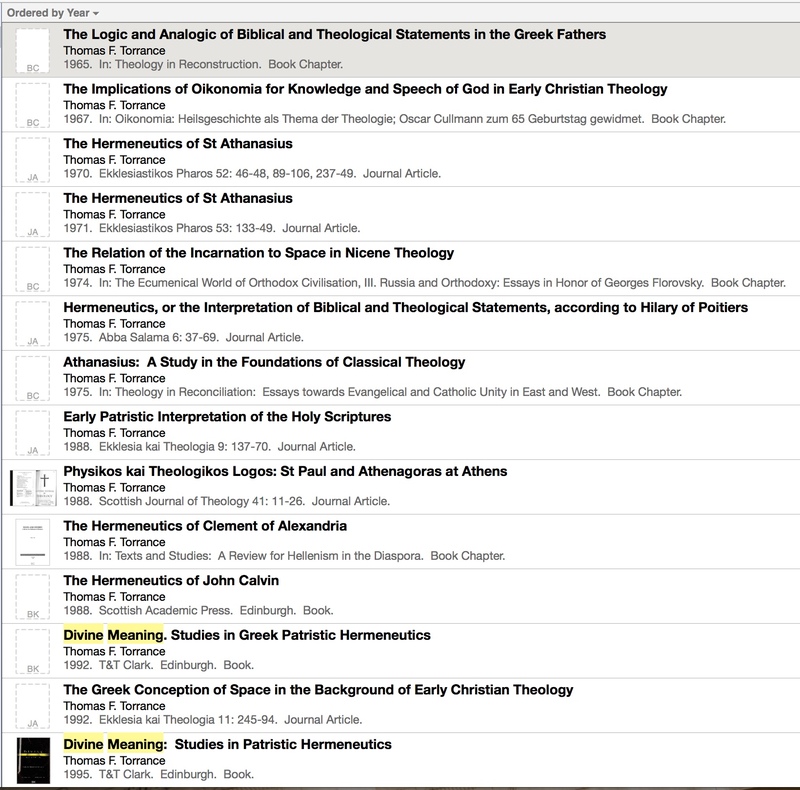 Torrance Theological Fellowship offers the bibliography of Torrance sources as a research tool to catalyze investigations of the Torrance tradition. Use the Library of Congress Class Number to walk straight to the right place in the stacks in your institution's library. With the included OCLC number, open the item's record in WorldCat with just one click and see libraries near you where that item can be found. With the included digital object identifier (doi), search online journal websites such as the Scottish Journal of Theology and jump directly to the online full text or pdf (assuming institutional access). With the included ISBN number, jump straight to the book on Amazon. Scholars new to the myriad of Torrance primary sources may use the bibliography as a thread through an otherwise overwhelming labyrinth. Elmer Colyer's "An Introductory Reader's Guide to the Published Works of T. F. Torrance," published in Participatio, Supplement 1 (2011), is conveniently re-posted on the Torrance Fellowship website. 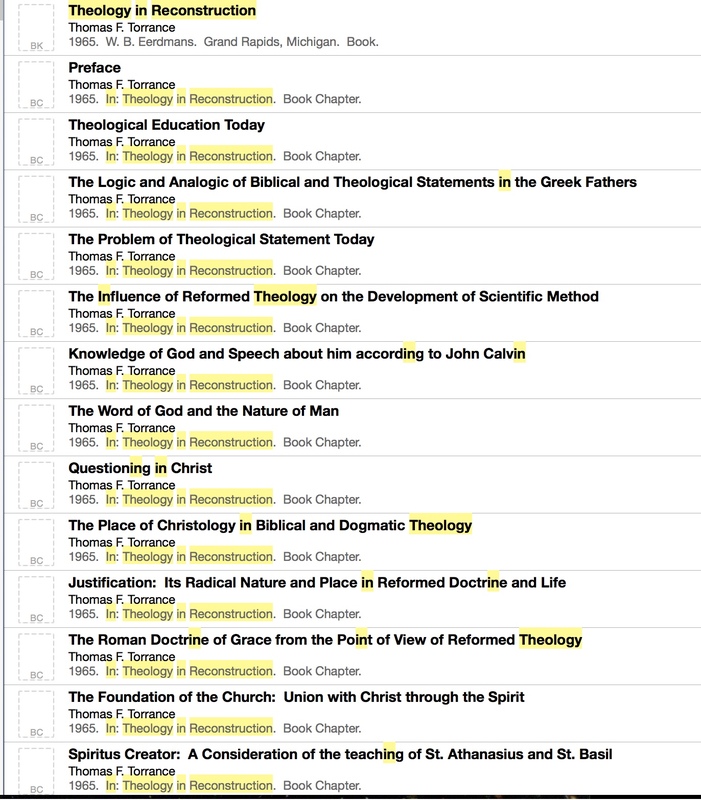 Titles of books, chapters or articles suggested by Colyer are tagged in the bibliography according to the Reader's Guide section in which they appear (see screenshot below). Scholars well-acquainted with Torrance's works may use the comprehensive, annotated bibliography to survey the life cycle of a publication and discover connections between sources that remained obscure and elusive before. Articles by Thomas Torrance were frequently republished, sometimes under different titles, or with revisions even under the same title. The Sources bibliography traces these connections. To aid in this purpose, the first edition of any book containing material published separately is entered into the bibliography in expanded form, with separate, individual chapter entries to manifest their relations to other articles and sources. Consider a concrete example: Try searching for "Knowledge God Speech" (without quotation marks). The search returns a chapter in Theology in Reconstruction (1965) entitled "Knowledge of God and Speech about Him according to John Calvin." The results also show an article with the same title published in Revue d'Histoire et de Philosophie Religieuses the year before. This article was elaborated and transmuted into The Hermeneutics of John Calvin (1988). The Notes field for the latter record reveals that Torrance regarded the 1964 article as distilling the "essence" of the 1988 monograph. 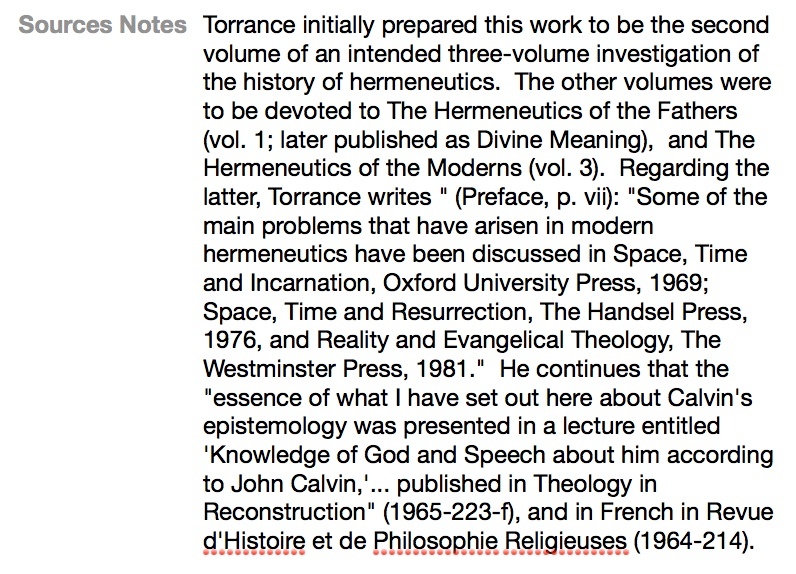 Consider another example: Search for "Divine Meaning," one of Torrance's studies of the history of hermeneutics. More than two dozen hits result from this search, including not only the book by that name published in 1995, but also the articles from 1965 onward that were revised and incorporated into various chapters of the monograph. Additional hits include sources in which Torrance discussed how his study of patristic hermeneutics in Divine Meaning related to his other publications on medieval, Reformation and modern hermeneutics. Similarly, more than 40 hits result, from 1947 to 1996, if you search for "Theology in Reconstruction" (include the quotes to search for the exact phrase). These search results include reprints of the entire book, and also the previous and later publications of individual chapters. Scan the list to count 4 publications in German, and 4 in French. Two of the chapters were reprinted in a 1979 anthology. Remember, individual chapter records are only given for the first edition in which they appear, not for later reprints. So, by looking for "Reprint-Revision" tags on chapter records for the 1965 edition, one sees that 12 chapters are reprints or revisions of previous publications. By examining the "Notes" field for each chapter record, one can quickly determine that some chapters are reprinted later, and that chapter 7 alone, out of 15 chapters total, was not published elsewhere. Keeping in mind that many publications originated in conference papers or invited lectures, and that any reprint may also be a revision, elucidating the relationships between items by using the "Notes" field and these other techniques helps one gain a better sense of the life-cycle of any publication. TIP: Search by McGrath number rather than by key words. Perhaps the most obvious way to find related publications is to search for a key word from the title, as described above. Key word searches may fail to catch related publications in other languages or related items with rephrased titles. Words may have variant spellings (does one search for "Saviour" or "Savior"?). Book titles or journal names may not be entered on a related record when published elsewhere. A key word search may also turn up extraneous items that share the same word but are actually not directly related in a derivative sense. Suppose you want to find publications related to Space, Time and Incarnation. A search by its McGrath number ("1969-262") yields a dozen results, including a Chinese translation, and a 1974 article which Torrance described as a "companion" to the first chapter of Space, Time and Incarnation ("The Relation of the Incarnation to Space in Nicene Theology"). This search takes advantage of a "Related Sources" field, which contains the McGrath numbers of publications that are related to the current record in an explicit or derivative manner. These might be earlier or later editions of the work, including versions of the work published as conference presentations or recorded in audio or video, or incorporated into larger works with different titles. (The nature of the relationships may be explained in the "Notes" field.) Searching by a McGrath number is thus a more precise and more powerful alternative to a key word search. Searching by the McGrath number will expand a key word search to catch related publications with different titles, and will narrow down a key word search by omitting items which are not actually part of a work's publication history. 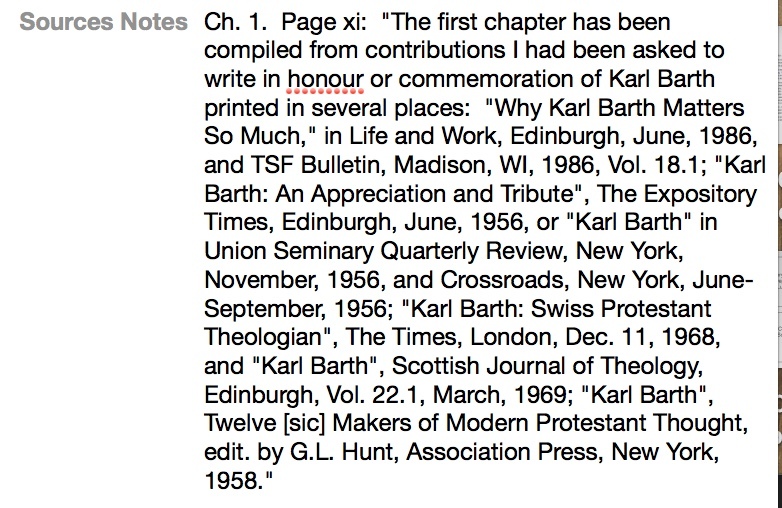 As another example, consider the first chapter of "Karl Barth: 1886-1968," in Karl Barth: Biblical and Evangelical Theologian (Edinburgh: T&T Clark, 1990), 1-26; #1990-517b. 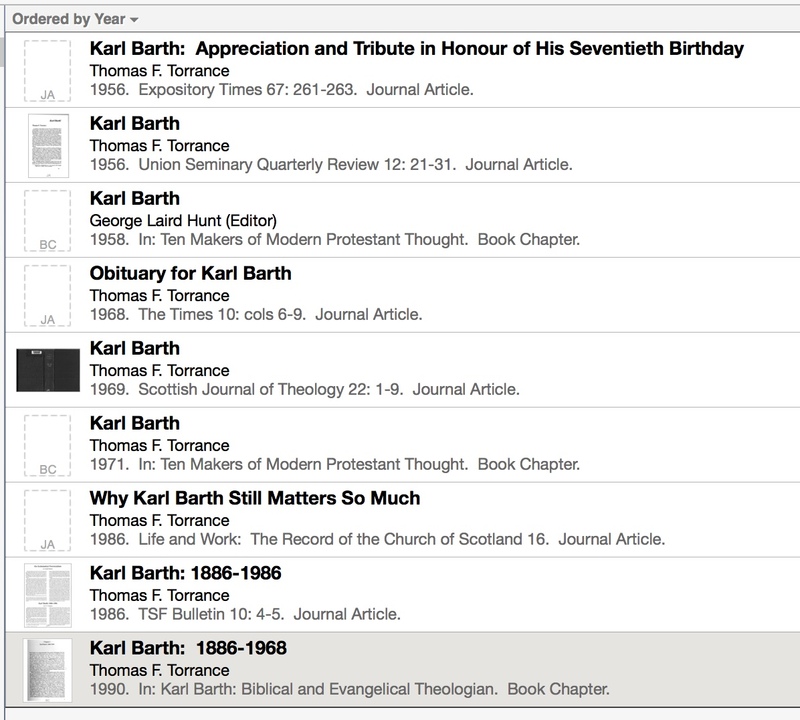 A key word search for "Barth" will turn up many hits, perhaps too many to be manageable. To investigate the publication history of this chapter, search instead for its McGrath number, "1990-517b." This search yields 9 results, ranging from 1956 to 1986. McGrath numbers for these 9 sources are listed in the "Related Sources" field. A description of the relations between the 9 publications appears in the "Notes" field. In many cases, searching by McGrath number offers an easy and powerful complement to key word searches. * This section is repeated, along with other information about McGrath numbers, in the McGrath Number FAQ. The most common reference types are Book, Book Chapter, and Journal Article. To facilitate searches (and interoperability), finer distinctions with reference types generally have been avoided (for example, newspapers and magazines are formatted as Journal Articles). Instead, tags are used to specify genre types such as Interview, Pamphlet, Obituary, Sermon, Book Review, Reprint, Translation, etc. However, there are a few additional reference types, less frequently used: In addition to Book, Book Chapter, and Journal Article, a Sound Recordings reference type is used for audio and video recordings of the three brothers; a Web Page reference type is used for websites and internet resources; and an Unpublished reference type is used for lecture notes and handouts. Restrict a search to the Book reference type to exclude articles and chapters, to generate a list containing only a book and its reprints, editions and translations. The lowly Pages field may be of help when considering whether a later publication has been revised. If you search within the Book type for "Mediation of Christ," it's easy to discover that a 1984 Eerdmans edition contains 108 pages, while a 1992 Helmers and Howard edition contains 126 pages along with xiv pages of front matter. To explain the discrepancy, one might suspect that the pagination may differ between these editions, making cross-citation problematic. Indeed, by examining the Table of Contents field and the custom Notes field, you'll discover that the 2d ed., published in 1992, contains a new final chapter. And you can confirm that the pagination differs as well even for the earlier chapters included in the first edition. If you forget to limit the search to the Book type, but search "All references," then the expanded hit list includes citations for audio recordings of lectures which provided the basis for the book. Curious about a reference to a particular author? A search of the bibliography for "Scotus" yields 6 publications about Duns Scotus by Thomas or James Torrance, 2 of which are book reviews. To narrow the results, you can search within any specific tag. For example, a search of items tagged "Book Review" for "Calvin" turns up 5 hits from the total of more than 80 book reviews. Are you interested in the global reach of Torrance publications? Search the bibliography for any language, such as Chinese, Korean, or Hungarian, to discover works like a Japanese edition of The Mediation of Christ or an Arabic translation of The Trinitarian Faith. Or use the bibliography "Translation" QuickTag to list translations in all languages in a single view. Are you interested in Torrance collaborators? One aspect may be disclosed by searching for the title of any series which Torrance edited. This will turn up the names of authors of books in that series. 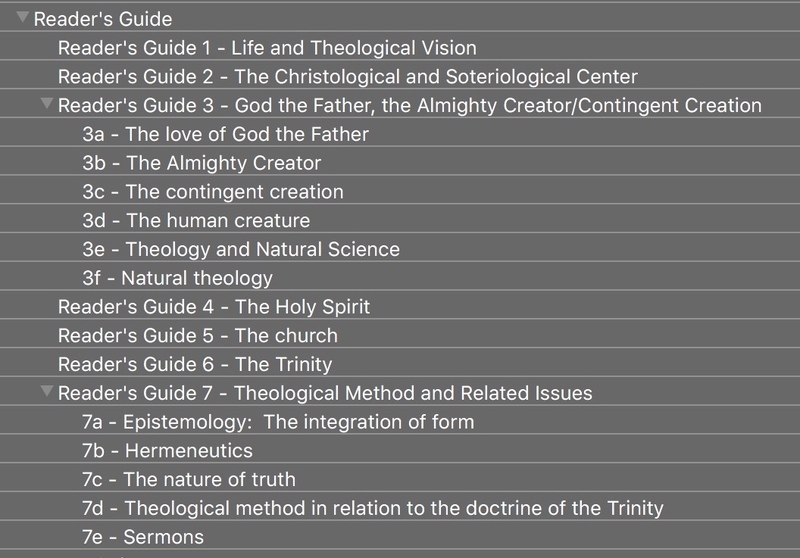 Try searching for the 12 volumes in "Theology and Science at the Frontiers of Knowledge" or the five volumes in "Theology and Scientific Culture" (include the quotes in the search field to search for the exact phrase). Who published the first volume in each series? Did any other authors publish titles in both series? These are some of the ways the Sources bibliography may serve as a springboard for your research, in addition to offering the practical advantages of pre-entered, verified data, and the automatic formatting of footnotes and generation of bibliographies. Are you preparing an article for Participatio? Two fields contain pre-formatted references; one for footnotes according to the Participatio style guide, and the other in Chicago style for compiling bibliographies. Just copy from the "Footnote" field and paste into your word processor and you're done, with little or no manual tweaking required. In addition, bibliographic software contains built-in style formatting for common style guides, such as Chicago, Turabian, APA, or Harvard (see Software Explanation). Note: Italics support in some fields was not supported when these screenshots were taken, but is now implemented. Additionally, at present, some of the functions described above work as described only in the the offline software library versions of the bibliographies. An online deployment of the Sources and Studies bibliographies is currently in development (using Drupal 8) that will enhance the capabilities of the combined bibliographies as a research tool. We hope to implement, for example, support for members to submit comments and recollections (with member attribution) that are appropriate for the Notes field, which describes the life-cycle or original life-setting of any publication. The Sources bibliography is the first step in a longer-term transformation of the Torrance Fellowship website toward the goal of creating a research hub for members and in service to other scholars, facilitating "deep dives" into the Torrance corpus while also orienting scholars new to the Torrance tradition. We welcome your input and assistance. Meanwhile, may this initial offering of downloadable Sources bibliography files serve as a practical place to begin.